Hobbits are well-known for their love of food. Typically, they would eat up to six meals in a day. Breakfast (7 am) – Breakfast is the first meal of the day in most countries. In the UK and Ireland, breakfast usually consists of a hot meal, featuring eggs, bacon, and sausages, accompanied by toast and either tea or coffee. Second breakfast (9 am) – A tradition in Bavaria and Poland, second breakfast is similar to the British tradition of elevensies. Typical foods to be enjoyed during second breakfast include pastries, sausages, sandwiches, or light dessert-type dishes, and coffee. Elevenses (11 am) – In the UK and Ireland, elevenses generally consist of cake (or other pastries) or biscuits with a cup of coffee or tea. Luncheon (1 pm) – A mid-day meal, generally smaller than a typical dinnertime meal. Appropriate dishes may include soups or sandwiches. Afternoon tea (4 pm) – Afternoon is very similar to elevensies, but is taken later in the afternoon (hence the name). Foods accompanying the afternoon are much the same as with elevensies. Dinner (6 pm) – In most cultures, dinner is the main meal of the day. It is a more formal meal, often consisting of three courses: appetizers (such as soup or salad), followed by the main course, and ending with dessert. Supper (8 pm) – Supper is the light meal which follows after dinner later in the evening. It is less formal than dinner. In some places, supper is simply a light snack prior to bedtime; in parts of the UK, supper may consist of a warm, milky drink with biscuits, cereal, or sandwiches. A typical Hobbit meal consists of simple foods, such as bread, meat, potatoes, and cheese – though they have an extreme fondness for mushrooms, surpassing their love of all other foods. 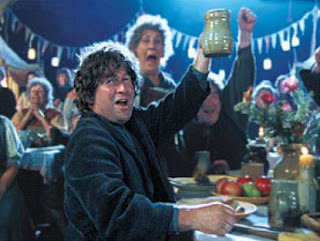 Ale is their beverage of choice; being social creatures, they often prefer to enjoy their ales in various inns across the Shire. Still enjoying your series :) Well done on keeping up with it! oh nps, glad I helped by accident!